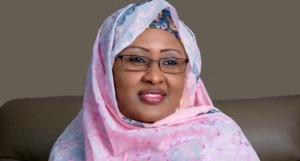 The wife of Nigeria’s President-elect, Aisha Buhari, has stressed the need for legislation that will protect the girl child from early marriage and women from other vices. Mrs Buhari was speaking on the side-line of the Global Women Conference held in Buenos Aires, Argentina, shortly after her presentation on the danger women and girl child contend with daily. At the gathering, social inclusion and empowerment for women topped talks. The wife of the President-elect, said global legislation remained the solution to most challenges facing women. She also called for legislation against early marriage. Women from Africa, Asia, Europe and the host continent, South America, came armed with expertise knowledge and the challenges women face across the world. Mrs Hannatu Ngilari, Dr. Hajo Sani and Mariyya Zayyan, were part of the Nigerian delegation at the event. They made their contributions at the conference. Speaking to Channels Television on some of the consequences of social exclusion of women, Mrs Buhari pushed for legislation that would protect women and the girl child. The Nigerian delegation and wives of governors at the Buenos Aires conference said they picked a few ideas that would enhance women empowerment scheme back home. The global conference ended with a call on government and international organisations to increase the participation of women in decision making process.